Before I go any further, I want to put in some disclaimers. The purpose of this is not to preach or moralise in any way – just present my point of view with as much balanced coherence as I can. I am not particularly moral (depending on your definition, of course), I’m not a saint (indeed with the sexual abstinence and piety, I don’t want to be one), I’m very frequently a hypocrite and this post may well be full of it. For example, I sometimes drink organic milk, and though the companies assure me it’s from cows who are free to roam and well treated, I don’t know. But I haven’t investigated this fully, so I am currently guilty of the same willful ignorance I’m about to point out in others. I will also occasionally eat fish as long as I have good reason to suppose it’s line-caught from sustainable sources. This makes me not even a vegetarian, and therefore an utter hypocrite. I haven’t looked into it properly, and I know that if everyone on earth wanted to be a pescetarian, the fish would disappear. But fish live in the sea (don’t they?). I understand that there are very good reasons of sustainability to be a vegetarian. I’m reliably informed that the resources needed to keep animals, even in the most barbaric and horrific torturous conditions, outweigh the nutritional benefits the animal provides to humanity. But this isn’t my reason for not eating animals, although it may be a good one. I might use this reason in a discussion to rationalise the decision I’ve made (which is partly although not entirely emotional and partly but not entirely subjective), but it just so happens not to be a reason that forms the basis of my opinion. I won’t go into that here, because there just isn’t time before you get bored! Now – shock horror – I don’t actually believe that eating animals is wrong. I couldn’t make a case for it or a claim for it beyond my feelings. It happens a lot, animals have more or less always eaten each other. Now as it happens I couldn’t bring myself to slaughter a pig or chicken or cow. I see the life in my fellow creatures and couldn’t take it from them. I’m sure that in the right circumstances I could, but I’m not in those circumstances. I’m in privileged, sheltered, fed, clothed, housed and generally spoiled and pampered circumstance. And in this environment I wouldn’t kill an animal. And to avoid the most basic hypocrisy, I won’t eat what I wouldn’t kill. That’s my baseline. But anyone who wanted to kill and eat an animal in necessary circumstances, I would not stand in your way. It also happens that I don’t enjoy the chewing of flesh (at least, mammal and bird flesh), because in my mind it feels too much like chewing human flesh, by which I mean chewing the flesh of a fellow being who is close enough on the tree of life to warrant such a comparison (more on that later). But this is beside the point, and it doesn’t constitute any argument for vegetarianism. My feelings are neither here nor there. But this tribalism and drawing of arbitrary “us and them” lines, is precisely the same way of thinking and being that leads you to say: “we can enslave the Africans – they are subhuman”, “we can, indeed, enslave and systematically slaughter the Jews – Sie sind undermenschen – subhuman. Animals. Rats.” It’s the same principle. It’s blindness, willful ignorance that denies the reality that all living things are in fact related, share a common ancestor and – on some level – are all expressions of the same life-force itself which is an ongoing process starting around four billion years ago and continuing well beyond our lifetime and perhaps that of our planet, solar system, or even galaxy. It may well be that plants suffer. The extremist fruitarians think so. But I have no reason to suppose that. 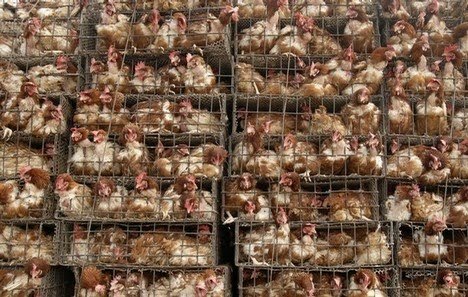 However, I do have reason to suppose that animals in our meat industries suffer immensely, for their entire lives. Now, there are those also who claim that because we breed them, we also have a right to treat them however we see fit. It’s essentially a god claim. We made them, we own them, and we can do what we want with them. Firstly, of course, it’s not true. By breeding animals, we don’t create them; merely provide a situational aid to the natural process. After all, slave owners in America systematically bred their slaves to be strong by pairing the right couples together. So therefore we created these slaves, own them, and have a right to do with them as we wish. It’s precisely the same principle, and it goes nowhere – like many arguments – because the premise is faulty. By breeding animals, we don’t make them or create life, we just expediate the natural process. We don’t do any of the making – the animals, like all self-replicating life, do it for themselves, enabled by us. Now yes, it’s true – if we had not bred pig A, he would not exist. So can we now do with it as we please? Well, if you grant it for this pig, you have to grant it for your pet dog, any slaves you may own (and for whom you paid good money) and – let us not forget – any children you may have created. The last example on this list should hammer home my point – do you own your children and can you abuse them in any way? You created them after all… Did Joseph Fritzl have the right to treat his daughter in the way he did? I mean he created her, which is more than can be said for breeders of animals. Imprisoned. Abused. Tortured. Enclosed. Enslaved. Who am I talking about here? What we do now know from the fossil record is that although our intelligence now seems so far above the “other” animals and primates, it was not always so. Going back some tens of thousands of years there were many other species of the homo genus – loads and loads of them – with different levels of intelligence. No one can know whether they were “like us” but they certainly had elements of ritual – in as much as they buried their dead. But, like 99.9 per cent (at least) of every species that has ever lived, they are no more. Homo-sapiens are the last survivors of the homo hominid class. And we came so very close to utter extinction – only 70 000 years ago the DNA marker evidence suggests that us 7 billion – as we now are – was a piffling few thousand. And we could have disappeared at that point along with our other fellow hominids, who did indeed disappear. But as adaptation and luck would have it (or God, if you prefer to think, who favoured us over the others… ah, we’re returning to “us and them again”!) we survived, multiplied and made it. But it so could easily have been otherwise, and some other hominid could have gone on to write this blog post – or whatever their equivalent was. Before long, we won’t be here anymore. We often feel that we are somehow immortal, and the blindness to the bigger picture of the ultimate brief transience of human life is partly what leads to this idea that our lives are important, whereas all other life is not. Again: us and them, humans and animals. What a fantastic article, very well written and some excellent points raised. And I’m not even a vegetarian!